Over the summer, Dr. Maxam and I had an amazing time conducting qualitative research on the perceived impact that therapy dogs have on college students. Through interviewing multiple Pace faculty members who are connected with therapy dogs, it is made clear that interacting with therapy dogs on campus has a positive impact on students. Beginning this research, I needed to do some background research on this topic. As a dog lover, I know a lot about dogs, but there were things I needed to learn before conducting this research. For instance, I learned the distinction between therapy dogs and service dogs, and stressed that throughout my research. Therapy dogs are not service dogs. Service dogs are specifically trained to perform tasks to help a person who is differently abled. Therapy dogs are trained to provide comfort, affection, and stress relief on college campuses, in hospitals, and other very stressful environments. Though the research conducted showed that students are positively impacted, there are some negative aspects to having therapy dogs on campus. Some students simply may not like dogs, and other students may be allergic. However, these events with therapy dogs give students the option to participate. Another concerned raised by this research is students who have phobias of dogs. Some of these students have spent time with these therapy dogs on campus, and the dogs have helped them conquer their fear. Ultimately, Dr. Maxam and I are conducting this research to implement a formal therapy dog program at Pace. Throughout our research, we learned that therapy dog programs have many components, and we had to see how this components could be implemented on the Pleasantville and New York City campuses. Things we need to consider include the cost, training, who would be the dog’s owner, if we would need multiple dogs, and where they would stay on campus. Once we have decided how the program should be modeled, we will present it, along with our research that shows the positive impact of therapy dogs on students, to President Krislov. 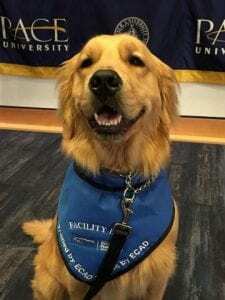 Pace University currently works with the Good Dog Foundation and has therapy dogs on campus on alternating Wednesdays, and during final exam week. These therapy dog events are very popular on campus. These events particularly seem to help college students with stress reduction. 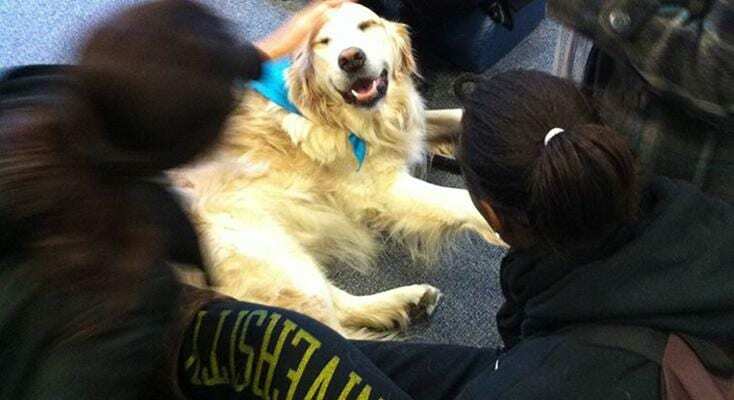 After spending time with a therapy dog, students are visibly in a better mood. For many students, seeing a therapy dog, or any dog on campus, immediately brightens their mood, as it reminds them of their own dog at home. For these students, the therapy dogs act as a springboard for conversation, and they talk about how much they miss their dog and how interacting with a therapy dog helps them feel less homesick and adjust to college life easier. Working with Dr. Maxam has been such an amazing experience. She and I both love dogs more than anything, so it was a great experience being able to research something that she and I are both super passionate. Whenever I needed help during my research, Dr. Maxam was one call away. I am so appreciative of Dr. Maxam for trusting me to conduct this research, and for the unconditional support she provided me. Together we pieced together ideas and components of what a therapy dog program would look like at Pace, and we were lucky enough to have our research be chosen to be presented at the International Journal of Arts & Sciences Multidisciplinary Conference at the University of London. I cannot thank Dr. Maxam enough for this opportunity. I am so grateful for where this research project has taken me, and I cannot wait to see what happens with our research in the future. Throughout this project, I have researched the impact of therapy dogs on college students. Dr. Maxam and I have scheduled interviews with professors at Pace University to ask them questions about their experience with therapy dogs, and to ask their advice on a possible therapy dog program at Pace. These interviews are still in the process of being conducted, however, my background research shows that college students reported significantly less stress and anxiety, and increased happiness and energy, immediately following spending time in session with a therapy dog. Based on preliminary data collected before our interviews have taken place some possible questions are what the cost would be to have a therapy dog program at Pace, and what specific components Pace would want for the program. Due to the increase of animal assistance in educational therapy over the past decade, finding research on this topic was not a challenge. The data I have found has shown that therapy dogs have a positive impact on college students, which is a success for the project. While doing this research, I have learned that multiple colleges in the United States have therapy dog programs. Specifically, Drexel University has therapy dogs year round, not just during midterms and finals weeks, which are typically the most stressful times for college students throughout the school year. These therapy dogs are on Drexel’s campus for 8-10 hours a week to help college students with their everyday stressors. As a college student, this project has made me more involved in ways to improve my own college experience as well as the experience of my peers. I will be working with Dr. Maxam to try to implement a permanent therapy dog program for Pace. This summer, I will be working with Dr. Sue Maxam on a research project entitled, “The Perceived Impact of Therapy Dogs on College Students.” Our research will examine the perceived impact of therapy dogs on college students from the point of view of faculty and staff who have observed students who participate in therapy dog programs on college campuses. Throughout this research I expect to learn the perceived emotional impact therapy dogs have on college students, as well as the perceived physical impact therapy dogs have on college students. I also expect to learn if there is any impact of therapy dogs on student retention, and I will examine what the components are of formal therapy dog programs on college campuses. To conduct this research, I will be interviewing faculty members at Pace University who have experience with therapy dogs and bring therapy dogs on campus, as well as interviewing people who have therapy dog programs around the nation. I will also be researching all of the components that go into therapy dog programs that colleges around the nation have implemented. Our ultimate goal of this research project is to bring a permanent therapy dog program to Pace University. The therapy dog in this program will be a full time faculty member with a Pace University ID, and will also have a schedule of where and when it will be on campus.